In a recent FPN program, three Florida grantmakers shared different strategies they are using to implement new place-based grantmaking programs in their organizations. Each funder is at a different stage in its program, and they are using different strategies and approaches, but the common thread running through all of their experiences is that they are trying to find new and innovative ways to better engage communities in grantmaking decisions that impact those communities. One of the presenters, Andrea Bradley, president & CEO of Palm Healthcare Foundation in West Palm Beach, described her foundation’s new “Healthier Together” place-based grantmaking initiative, which seeks to improve the health and well-being of people in a community and build the community’s capacity to take action itself to improve its health. The foundation mapped its service region of Palm Beach County on a number of different factors (number of people with diabetes, teen births, 211 crisis and support group calls, etc.) and identified six “hot spot” communities in the county to be involved in the initiative. A recent FPN program spotlighted three case studies of Florida grantmakers who are trying new strategies to engage communities in grant decisions. 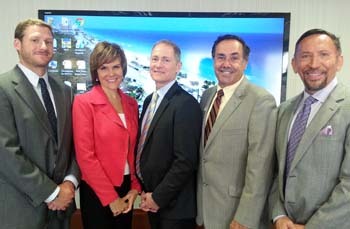 L-R: Presenter Stuart Kennedy, The Miami Foundation; Presenter Andrea Bradley, Palm Healthcare Foundation; Host David Biemesderfer, Florida Philanthropic Network; Presenter Steve Marcus, Health Foundation of South Florida; Moderator Miguel Milanes, Allegany Franciscan Ministries. In each community the foundation will bring together key community leaders – healthcare providers, nonprofit executives, teachers, government officials, business executives, faith-based leaders and members of civic organizations – who will guide the initiative in their neighborhoods. These community teams will identify a critical health issue facing the community and develop an action plan designed to solve the issue. Each community can participate at the highest level of the initiative if they so choose. The foundation is at the beginning stages of this effort, and Bradley emphasized that they want to focus on longer-term systems change in each community. The foundation plans to invest more than $2 million annually in the initiative for the next 4-5 years. Another health-focused foundation, the Health Foundation of South Florida (HFSF) in Miami, recently launched a new Health Community Partnerships initiative that is using a place-based strategy to improve community health. At the FPN program the foundation’s president and CEO, Steve Marcus, described how HFSF identified 11 communities across Miami-Dade County to be eligible for the partnership. Unlike Palm Healthcare Foundation, HFSF is using an RFP application process to identify the finalists. After investing extensive time and resources in learning about the finalist communities, the foundation will identify two communities to be involved in the partnership. HFSF’s place-based strategy involves a host agency that will lead the initiative in each community, as well as a host council and subcouncils that will ensure broad, multi-agency and resident engagement and representation. Through the host agency and the councils, the community will develop an action plan that will focus on five health issues. Each community’s plan must address the provision and promotion of physical activity, along with four additional issues that the community will pick from among nine priority areas of the foundation. HFSF plans to invest up to $7.5 million to support the partnership in the two communities over a six-year period. A different kind of place-based grantmaking strategy is being used at The Miami Foundation. Presenter Stuart Kennedy, program officer for the foundation, described the thinking behind their recent Public Space Challenge, which the foundation launched earlier this year to engage the community in discovering the best ideas for improving, creating and activating local public spaces in Miami. The challenge used a highly interactive online tool that let anyone submit an idea or comment on an idea. A group of community experts and professional placemakers chose 15 winners, which received a total of $130,000 in funding support. The challenge is part of the foundation’s broader goal to increase the number of young, talented people in Miami. Kennedy said the foundation was pleased by the community’s response to the challenge – they received more than 250 ideas – and by the high quality and high level of creativity of the ideas that were submitted. He noted that a critical ingredient in the challenge’s success was the foundation’s partnership with the Project for Public Spaces, which produced the challenge, and with ioby, which provided the technology. The grantmakers attending the program got into an engaging discussion about the practical implications of place-based grantmaking work for foundations. For example, the skills needed by foundation staff to help guide communities in developing funding priorities can be quite different from the skills needed to conduct an RFP process to choose grant recipients. And foundations interested in engaging deeply with communities through place-based grantmaking work may sometimes have to overcome a high level of distrust that communities may have based on past experiences of grantmakers coming in and out of a community without making a deep, long-term investment. Whether you want to call these efforts “place-based grantmaking” or some other label, the bottom line, I think, is that more grantmakers in Florida are showing an interest and willingness in trying out new ways to engage communities more directly in funding decisions that affect those communities. There’s still a lot to be learned about how to be most effective in implementing these strategies, and whether they will produce better results than more traditional funding methods, and FPN looks forward to continuing to provide a space for grantmakers and communities to share what they’re learning. This entry was posted in Florida Philanthropic Network, Health Care, Place-Based Grantmaking and tagged Allegany Franciscan Ministries, Health Foundation of South Florida, Palm Healthcare Foundation, The Miami Foundation by Florida Philanthropic Network. Bookmark the permalink.